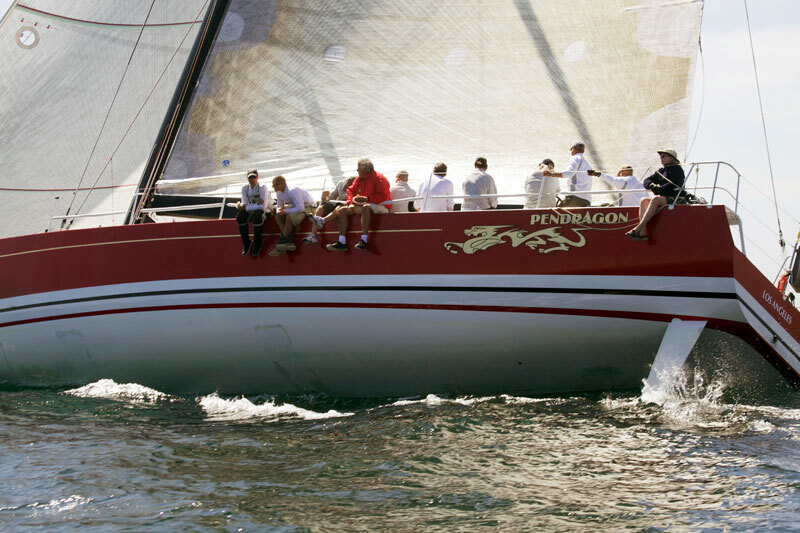 LONG BEACH — With more than 60 entries to date and with just a few days left to enter, John MacLaurin’s Pendragon 6 is currently the scratch boat to beat in the inaugural Border Run2 race — starting off Long Beach June 29 — with a blistering -147 rating on the Coronado Course. The boat’s closest competitors are two multihulls: Randy Reynolds’ CAT ATTACK II, a Reynolds 33 Turbo catamaran that rates a -70; and Chris Slagerman’s Go Cart, an all-carbon 30-foot Seacart trimaran that rates -100. All three boats are entered in the Border Run2’s 108-nautical-mile Coronado Course and will sail around Coronado del Norte island and finish off the Shelter Island Fishing Pier in San Diego. On the race’s 87-naurical-mile San Diego course, Jim Partridge’s Rapid Transit, an Antrim 49, is the current scratch boat, with a super-fast -96 rating. His biggest competition for line honors is Scott Klodowski skippering Insane Asylum another R33 Turbo catamaran that rates -70. “The wind and weather conditions will probably determine the boat that gets to the finish line first,” said Reynolds, skipper of CAT ATTACK II and co-founder of the race. Starting the Friday after Long Beach Race Week, Border Run2 will welcome all types of boats — from dinghies, multihulls, PHRF racers and cruisers to kiteboards — to race. And event organizers said they plan to offer shorthanded Long Beach Race Week delivery crews and owners a fun way to deliver their boats back home: To help Race Week sailors sail in both events, Border Run2 organizers have arranged free boat slips until the day of the race through Gladstone’s of Long Beach. Race organizers have also designed all Border Run2 courses to appeal to both racers and spectators, Reynolds said. With four courses to choose from, Border Run2 starts off the Belmont Pier in Long Beach at 11 a.m. Friday June 29 and allows sailors to finish in Newport Beach, Dana Point, San Diego direct or San Diego via Coronado del Norte island. For the Newport Beach course, the finish will be off the Balboa Pier. For the Dana Point course, the finish can be seen off Dana Point Yacht Club. And for the two San Diego courses, the finish can be seen off the 24-hour fishing pier on Shelter Island anytime after 6 p.m. June 29 to 6 p.m. June 30, depending on the wind. Also new this year, the BorderRun2 Trophy Party for the San Diego Course is planned at Driscoll’s Shipyard on Shelter Island. With live music, free beer and food, racers can also bring their own food and beverages to the party, giving this summertime Border Run2 event the feel of a Fourth of July barbecue with friends and family, Reynolds said. Border Run organizers are also including free photos for all racers of their boats and crews, available for downloading from the Border Run2 website. The 2012 Border Run2 is organized by XS Sailing.com, Shoreline Yacht Club of Long Beach (the organizing authority) and Dana Point Yacht Club; sponsored by West Marine, Gladstone’s of Long Beach, and Ullman Sails; and outfitted by Pirates Lair. For more information on the race and to enter, go to TheBorderRun2.org or call (800) 366-8584.